Whether you are moving just a few filing cabinets and a desk, or, relocating your whole business, we can assist with project managing every stage of your moving process. We deal with all types of business moving from general office relocation to engineering departments including the moving of heavy plant and equipment. You will want a named contact, a key member of our staff, who will see the whole process through from start to finish. Your project manager will be in constant contact with you to ensure nothing is left to chance. From removing excess documents and records to our store in preparation for the move, to dismantling and reassembly of new and existing furniture and supply of specialist document and IT crates, we have the expertise and equipment to make sure the down time is minimal and your business makes a smooth transition so that your customers know you will be ready for their call from day one at your new premises. To start planning your next business move, ring our Operations Team and speak to Alan Bennett or Liam Weaver – we can help the commercial removals process begin, by arranging a bespoke survey visit to your existing premises and start gathering the information we need to provide you with your business moving plan and associated costings. 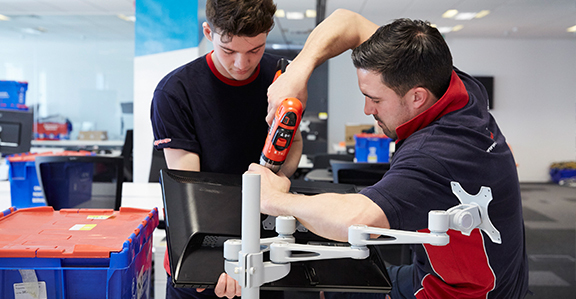 We will liaise with your IT department and ensure that all arrangements are in place, crates delivered for packing and loading documentation, equipment and IT, ready for when you need staff to commence packing, we can even provide a packing service for you if time is in short supply. We anticipate that you will want our emergency contact numbers for last minute requirements or changes you need to make – we are used to just such events and in our industry we expect the unexpected when it comes to date changes, destinations altering and events beyond our client’s control. At Britannia Bennetts we always have a solution and we know that is the reason our clients come to us, our professionalism and integrity our held in high esteem by our local community and many of our local commercial moves are recommended by businesses that have already used our services. Your project manager will be on-site during the removal process to ensure that everything follows according to your careful instruction and when all the crates have been unpacked simply ring us and we will arrange their collection. Contact us today to find out more about our commercial moving service, our commercial movers will help your big day run smoothly. Your reliable Worcestershire commercial moving company, local moves made easier. Perhaps you require our shredding services too?